The Children’s Rights Alliance gave the government the highest grade since its ‘report card’ series was introduced in 2007. Paul Gilligan, Chair of the Children’s Rights Alliance, 8-year-old Ava Reid and Tanya Ward, Chief Executive of the Children’s Rights AlliancePic:Marc O'Sullivan. 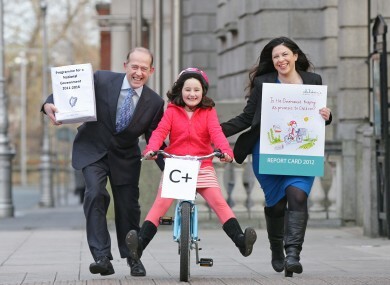 THE GOVERNMENT HAS been given a C+ grade in the Children’s Rights Alliance’s report card for 2012. This is the best grade achieved by any Irish Government since the report card series was introduced in 2009. The government’s decision to provide the Minister for Children and Youth Affairs with full status at Cabinet. The establishment of the Department of Children and Youth Affairs. Approval for a new children’s hospital. A commitment to hold a referendum on children’s rights in 2012. Budget 2012’s failure to protect children, plunging vulnerable families further into poverty. Its treatment of children in detention in St Patricks’s Institution. Tanya Ward, the Chief Executive of the Children’s Rights Alliance, said that as new Chief Executive, “it is a matter of great satisfaction to me to be able to award this Government an overall C+ grade on its key promises to children”. However, it is not all good news, with Government performing poorly in some critical areas. The Government is allowing an austerity driven recession to trample on the rights of children and their families and it is also failing to act on the incarceration of young people in St. Patrick’s Institution. Ultimately, the grades awarded in Report Card 2012 are based on the new Government’s intentions. Next year, in Report Card 2013, we will be basing our grades solely on deliverables. But, I’m confident that, overall, this year marks a fresh start for Ireland on its journey to be one of the best places in the world to be a child. The Irish Penal Reform Trust commented on the fact that the government received an F grade for the treatment of young people who are detained in St Patrick’s Institution. That the Government received its lowest grade for its performance on commitments to end imprisonment of children in Ireland underscores the seriousness of the issue. For every year that the Lusk project is delayed and no interim plan is put in place, hundreds of sixteen and seventeen year olds will have the negative experience of St Patrick’s Institution. It is a stain on Ireland’s human rights record, and it must be addressed with urgency. Report Card 2012 looks at the Government’s own commitments to children in the areas of education, health, material wellbeing, safeguarding childhood, and realising children’s rights. The CRA tracked 23 commitments within the Programme for Government and then recommended 29 immediate actions that the Government should take in 2012 to promote the rights of children. A number of figures welcomed the news. Fundamental reform of our child protection services is vital if we are to do our very best for vulnerable children and families requiring substantial support and protection – and I look forward to the Agency’s establishment. Meanwhile, Judge Catherine McGuinness, Sheila Greene, former director of the Children’s Research Centre in Trinity College Dublin and Sally Anne Kinahan, Assistant General Secretary of the Irish Congress of Trade Unions, also welcomed the report card. Email “Government given 'C+' grade for children's rights ”. Feedback on “Government given 'C+' grade for children's rights ”.